Helga Steppan works using photography in combination with installation, moving-image and elements of performance. Her work is conceptually driven; she sets up clearly defined parameters to work within and then attempts to fulfill the criteria she has imposed, documenting the process and results. This way of working can be clearly seen in the series 'See Through' for which Steppan audited all of her belongings and divided them into a full spectrum of different colour groupings. These groupings were then arranged according to classical compositional values and photographed. 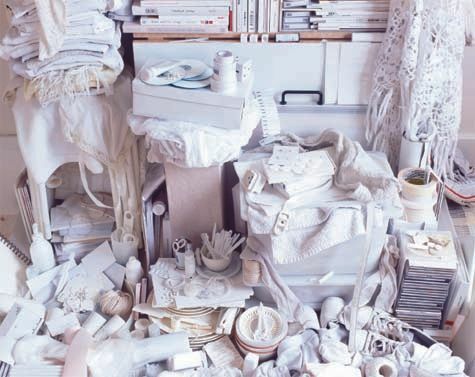 The final images are visually seductive and ask the viewer to consider whether they can discover the artist's persona reflected in the meticulously constructed installations of her material possessions. In 'Belongings Apart', Steppan has invited her friends to lend her something they own which is transparent. The objects will be presented at Man&Eve as a large sculptural installation, shown together with photographs of the different locations where they previously belonged and a written piece by each owner. The written texts describe the meanings and associations which the objects hold for their owner. Removed from their original environment and juxtaposed with other objects in a new context they become anonymous and subject to multiple different readings and interpretations. 'Belongings Apart' questions the extent to which an object or possession can ever represent its owner or hold particular meaning and invites the audience to discover its own associations in the work. A publication called 'Belongings Apart', which documents the process, will accompany the exhibition and includes an introductory essay by Š sa Stà¥hl.